Since I was going to be away from home on Father’s day, I decided to treat myself to an early gift and make a reservation at Atelier Crenn in San Francisco. I figured I could break the bank and a little and treat myself to my first two Michelin star experience. My rationale was two-fold. First, they have a condensed tasting menu which allows one to experience the restaurant from $120, a far cry from some competitors who request more than $200 for their similar sized menu. Second, I’ve had a food crush on chef Dominique Crenn even since I saw her appearances on both Iron Chef America (in which she beat Michael Symon) and as a guest on Top Chef (in which she won the French vs Spanish food challenge). I walked up and down and up and down and up and down Fillmore to get there and was seated quickly as I waited for my work colleague who agreed to join me in order for this culinary expedition to begin. In the meantime, I hit the washroom (or restroom as the Americans say). Even a two Michelin star restaurant adheres to the San Francisco norm of a unisex, single washroom philosophy. Once my colleague arrived, we were presented with the aforementioned option of the $120 condensed menu or the more elaborate $195 one with close to 20 courses. As stated above, I opted for the former. The menu is presented in poetic form, leaving the dishes to both the imagination and a reliance on tips your grade 12 english teacher gave you about how to interpret Shakespearean stanzas or the opiod-filled sagas written by Samuel Taylor Coleridge. The menus seem to rotate according to the seasons, so I got the spring edition. We did not opt for the wine pairing but were quite happy to indulge in a couple of the excellent Belgian beer from the small beer menu (I imagine even Chef Crenn couldn’t justify trying to serve a French beer with her food..I doubt a Kronenbourg 1664 would make the cut). In particular, the Strubbe’s Flemish Red ale was quite delicious and nicely complemented to the array of food that was served over the evening. A spin on the French aperitif Kir, this amuse bouche was served with a warning; don’t bite it until it’s in your mouth. It had a delicate exoskeleton of a hazelnutty-cocoa filled with a cider-based elixir. It certainly stimulated the taste buds and reminded me to quit thinking and let my peanut of a right brain run the show for once. My initial thought was I might get a bowl of tiger tail ice cream. My mother, who grew up wishing she could have given birth to a Bengal tiger, would often truck us out to the ice cream parlor. Whereas I would have an ice cream I hadn’t tried before, she ALWAYS got tiger tail which is orange flavoured with licorice streaks. Thankfully, this was a duo of hors d’ oeuvres. The first was an oyster seasoned with green apple, tobacco and coffee. The second was a sea urchin mousse topped with salty caviar. The texture of the mousse and the combination of flavours in the the oyster were sublime. 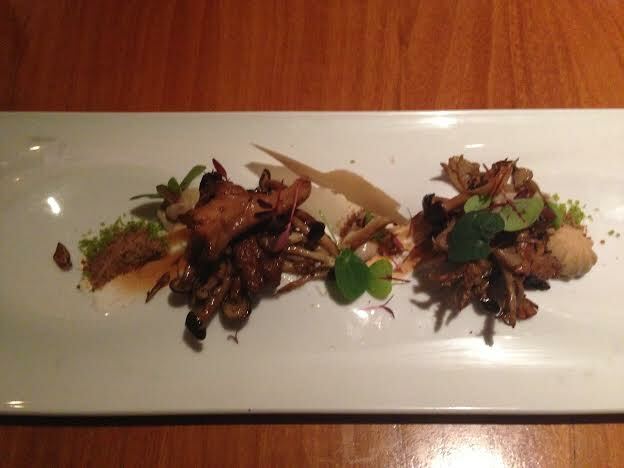 The coffee was ever so subtle but added a surprising and delightful finish to the starter. 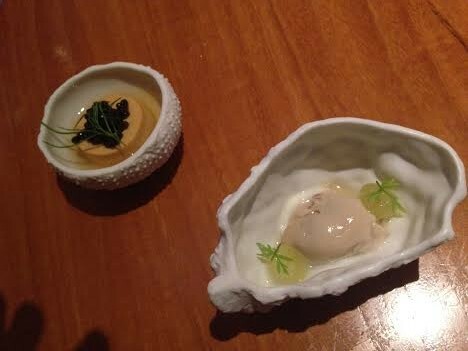 The poetry of the evening was further exemplified by the use of the urchin and oyster shell shaped dishes. Hidden beneath an array of green was a piece of Japanese mackerel which was served raw. The freshness was evident but what blew me away was the cilantro ice dust which started benign but ended with a blast of flavour which filled the dimensions of my mouth like spray paint. It was one the most surprising, elegant and magical movements of the evening. The finishing touch was a fried foodie-friendly turnip which was strewn across the plate. I think a French chef would be remiss without trying to redefine some of the more stereotypical homeland dishes which have been bastardized by years of American influence. Take french onion soup for example. Chef Crenn replaces the salt-laden, broiled cheese and bread covered thick broth with a more complex and refined base of caramelized onion with a delicate red wine vinegar gelled cheese dumpling bobbing in the middle. 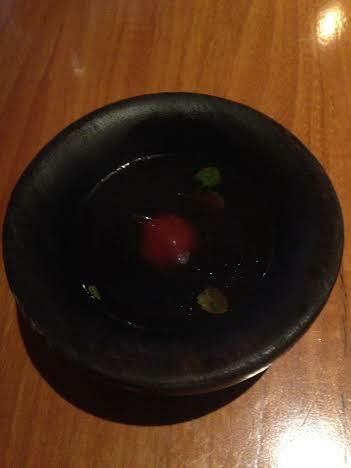 The dark, scarlet broth surrounding the dumpling did in fact look like a moonlit scene. Tastewise, it was refreshing and it was quite pleasurable cutting into the tender dumpling which was a easy target once the surrounding gel dissolved into the broth. If anything it was on the sweet side but that didn’t take away from the experience. 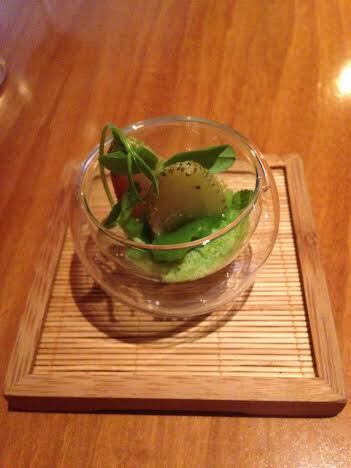 The intermezzo was a simple pickled green strawberry salad with watercress and more magic green dust. Sour, acidic, vibrant and palate cleansing. My grade 13 english course told me that this could either be mushrooms or a toothpick. Luckily it was the former. A collection of fresh and rehydrated mushrooms were strewn across the plate and adorned with a variety of other earthy flavours, most notably what I think was a hazelnut rosette on one side of the plate. The lack of symmetry meant I didn’t get another one on the other side but instead was treated to more pixie dust so I was just fine. It only makes sense that a chef who practices poetic culinaria would name a dish after a line from a poet on the literary side. “These creatures, who move with a slow vague wavering of claws” comes from the “The Lobsters” written by Amercian poet Howard Nemerov. It’s a sombre tail of the imprisoned somnambulists faced with the ultimate destiny of being served to humans beside a sauce of melted butter. 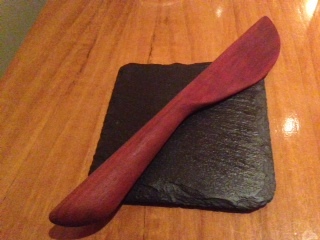 Other than that, the only clue we received was a mysterious knife which looked too innocent to do anything harmful. The puzzle was soon solved with the arrival of a chuck of brioche bread and flavoured butter. 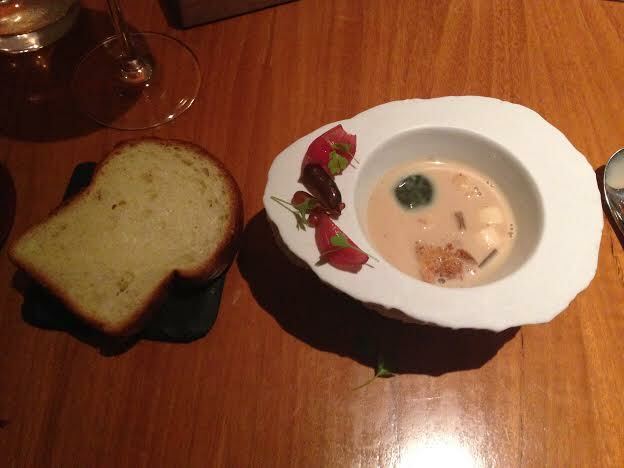 Soon after, a lobster bisque arrived accented with sweetbread biscuits and bone marrow and garnished with pickled onions and sea grapes. The soup was rich on rich which was cut somewhat by the acid in the onions. Honestly, I found the brioche mediocre but the soup delicious. By the way, biting into a sea grape which, like a 4-year old with red smarties I saved until the end, tasted like biting into a mouthful of ocean. Now that we were getting the hang of the menu game, we arrogantly proclaimed that the next dish had to be duck. I mean, the clue combined with a French chef at the helm made perfect sense. Even Inspector Clouseau could figure out that one. 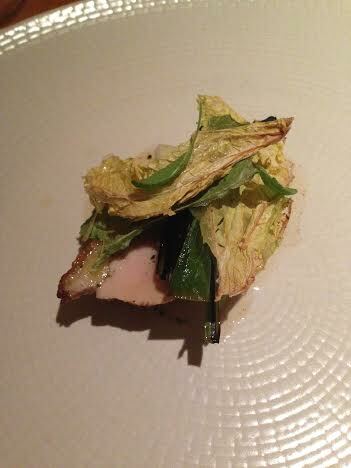 However, we were thrown a french twist when a piece of guinea hen showed up. Served far from overcooked with some fried greens and a slightly rendered fat cap, it was a fine enough finish to the savory component of the meal athough likely the least remarkable. Do guniea hens sing anyway? Ok, I made that one up but it sounds better than just saying the cheese course. My lack of will power coupled with the fact that I had to stare at these blocks and wheels of dairy goodness made resistance futile. 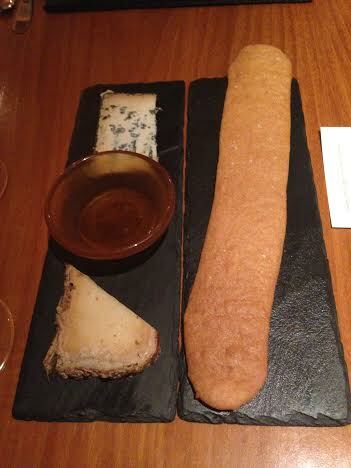 Of the four french cheeses available, we opted for a blue and a raw cow’s milk offering. Served with honey and a cracker-like loaf, both were exquisite and a nice addition to the meal for an extra $25. Guessing which French dessert would be served would be near impossible, especially since we were humbled by the last course. 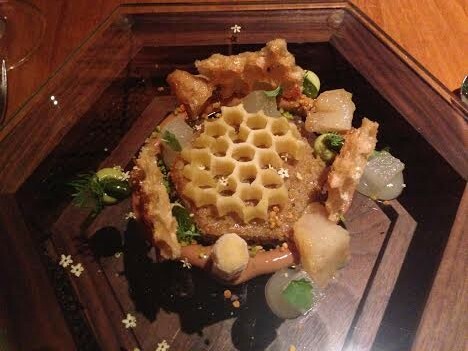 After a short wait, a trio of waitstaff arrived carrying two plates and what looked like a honeycomb. The latter was placed between us and I had a sudden urge to play ping pong. The dessert itself was a nicely executed combination of sorbet atop a lavender or chamomile or some kind of girly tea-flavoured cake accented with a few other sweet sauces but no table tennis paddles. 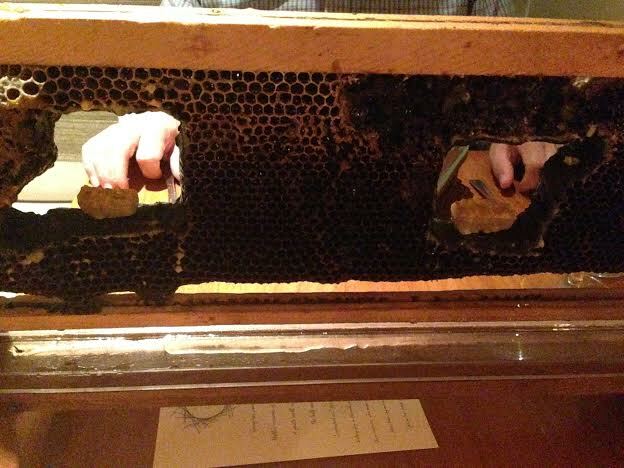 Hidden within the comb were the surprises: beeswax coated honey bonbons which brought me back to the days of spending nickles and dimes on wax teeth filled with some concoction of sugar and food colouring. Visual, it was stunning. Tastewise, it was quite acceptable as well. This line is made up too. 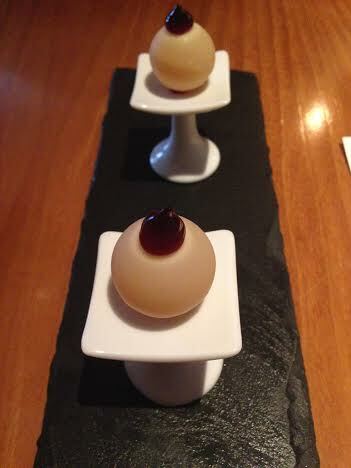 It describes the trio of mignardises (ie little desserts) that arrived after the meal. 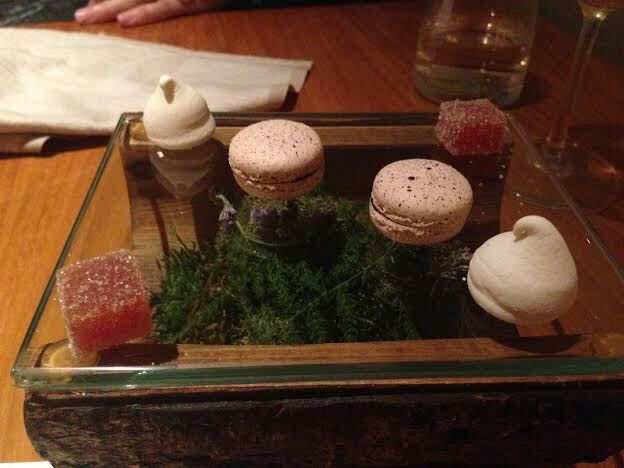 Homemade marshmallow kisses, guava fruit gummies and blackberry macarons we laid out on a glass platform. Delicious! Atelier Crenn is definitely a bucket list restaurant for anybody who wants to experience a Michelin two-star restaurant, meet a celebrity chef or justify the copious amounts of time spent reading poems in high school. Once again, my mom was right when she said “you’re going to need this stuff in real life some day” about my english classes. I agree with the thousands of reviews on yelp, urbanspoon, tripadvisor etc. which state that the food is whimsical, artistic, creative and delicious. One thing I found a little interesting was the fact that the menu was almost completely void in red meat and pork. Perhaps San Francisco rubs off on even the most discerning French chefs.The service aspect has been more of a contenious debate, however. First, I appreciate Chef Crenn making the rounds. She was far from modest when I told her I was an adoring fan who knew she won both Iron Chef and the Top Chef competitions. Second, I agree with some reviewers that the service is somewhat pretentious but I found nothing wrong with it. Nothing bothers me more than phony waitstaff who assert their supposed knowledge above the heads of the very people they are meant to serve. That was not the case here. Instead, I found it to be more of an orchestra of professionals. For example, despite the fact I was seated against the wall in the middle of the restaurant, the servers also approached the table doorside, even it if meant taking the longer route around tables. At least 4 or 5 service staff delivered food throughout the night and each was as skilled as the next in explaining the dishes. Part of a tasting menu is always the element of surpise and the openness of the layout of this place can spoil things a bit. I got really lucky for two reasons. One, we were a few courses ahead of the table beside us so our experience wasn’t tainted by seeing them get their food first. 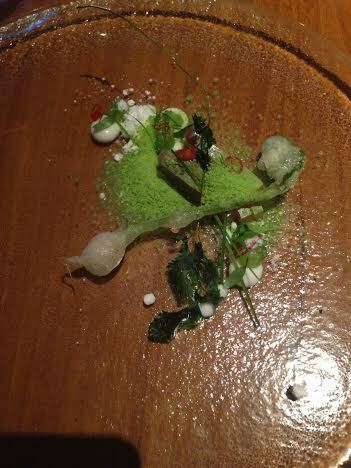 Second, they went all out and got the full tasting menu so we also got to see what we didn’t get. In the end, Atelier Crenn was an investment in a great dining experience. It had all the elements of a night of fine dining including poetic references, shaking hands with a celebrity chef and fantastic food,great beer, exquisite cheese and magic fairy dust. I can summarize the experince in one poetic line: Looking up in the sky I see two rightful Michelin stars beaming down. Gosh, your post has me salivating! That honeycomb… And those macarons… I’ve always wanted to go to Atelier Crenn but ended up elsewhere while in San Francisco. So I’ll just have to make a point in going next time! It was fun. I never made to Burma Superstar but hit a bunch of great places. Hitting the NYC for a quick trip in a couple of weeks. Burma Superstar is pretty good, but you just gotta be ready for that wait… Oh gosh, the food in NYC is endless – I can never stop going back!